When to Book Your Wedding DJ? With so many wedding magazines, guides, websites and blogs out there, there are plenty of opinions about when you should start looking for all the different vendors and services you’ll need for your wedding. 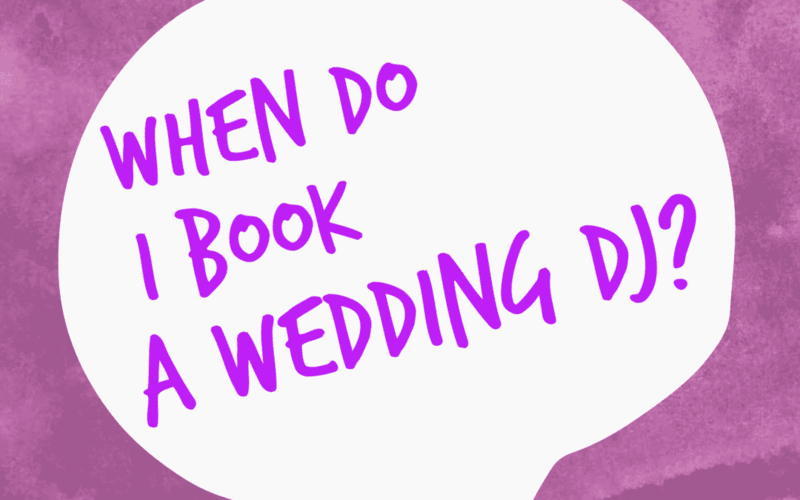 So, how early should you book your wedding DJ? Quick Tip #1: Start Early: 12 Months! My rule of thumb is one year (more if you can!). Some may think that is too far in advance, but consider this. In Montreal, where the high wedding season is only a few months long, think about all the other couples getting married and probably wanting a date in the high season also. Venues, DJ’s, bands, photographers, videographers, caterers will also be booking other types of events during the wedding season, corporate parties, anniversaries etc. Can you start to see how prime dates, at great locations, with great vendors and services can start to fill up quickly? Some people think booking the entertainment for a wedding is not high on the priority list and wait till 6 months before to book. Whether you choose a DJ or a band, finding the right fit for you is extremely important. The entertainment will make or break your reception, it is of utmost importance! If you wait too long to start your DJ or band search, you risk having to go with your second or even third choice because they will have already been booked. I often get clients booking me 12 to 16 months ahead of their wedding. I am usually their second or third step in the planning process. Of course sometimes we get lucky, and there will be an opening when someone calls for their wedding in 3 or 6 months, but don’t risk it! Quick Tip #2: What Should I Book First? Often times, numbers 3, 4 and 5 will be rearranged, but all make the top five! The earlier you start looking and making decisions, the easier it will be, you will have more time to plan things out and not rush. Try to book your DJ or band at least a year in advance to get your first choice! There is nothing worse than doing all the research, getting the quote, everything is perfect, and you call back in a few months to book them, and they are already booked. Not only do you not get what you want, you need to start all over again. Quick Tip #3: What Questions to Ask a DJ or Band? When you find a potential DJ or band, what should you be asking them? Read this report to find out! Quick Tip #4: How much should a Wedding DJ Cost? And finally, how much should a wedding DJ cost in Montreal? What should you expect at different price levels? Check out the Ultimate Pricing Guide to Wedding DJ’s in Montreal here!. How about you, when do you think you should start booking the key vendors and entertainment for a wedding? Post your comments below! If you are looking for a wedding DJ in Montreal that can create a truly unique reception and the best wedding ever – before the party even starts – Uptown Xpress is your number one choice for an unforgettable wedding entertainment experience. Stefan Jez is the only specialized wedding MC and DJ in Montreal, contact Stefan at 514-297-3508 or stefan@uptownxpress.com to begin your experience today! I was just talking about this with someone a few days ago. Working with the DJ and getting a plan for “the things you are going to do” makes the rest of the planning so much easier. You visualize yourself in the moment and add whatever is in your vision. A lot of couples do it completely backwards, worrying about what stuff to buy first, then figuring out what to do with it later. No wonder they are stressed out!